Middle Eastern foods on Staten Island are not nearly as plentiful as they are just across the Verrazano Bridge in Bay Ridge, but this creates a problem for the island's inhabitants who want foods from back home but are not so hot on the $17 toll. A relatively new restaurant on Forest Avenue in West Brighton is trying its best to fill this void, with a range of fresh meze plates and grilled meats. The Syrian owners have created an elegant atmosphere that is dressed up quite well, but the service is unfussy and relaxed. 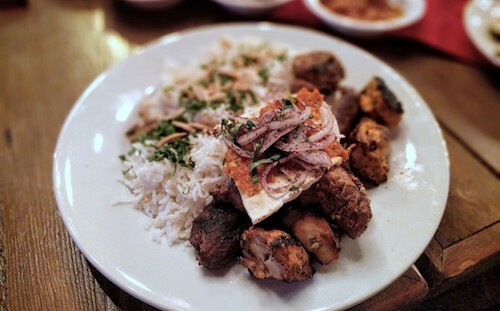 A good way to ease into the place is with the Mar Mar combo ($17, below), a selection of four homemade cold meze dishes. 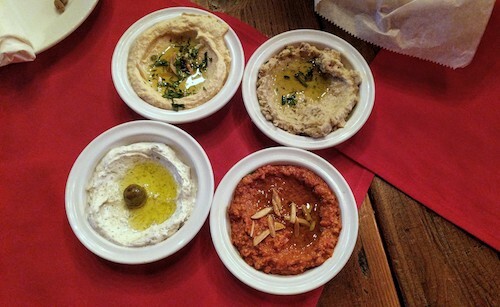 Along with staples like hummus, baba ganough, and lebneh, the 4th item is muhamara, a must in any Syrian establishment. 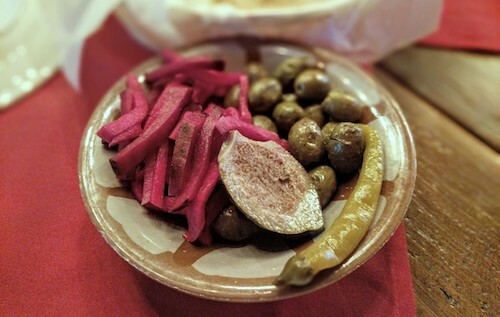 At the bottom right, muhamara uses the famous red peppers from Aleppo mixed with crushed walnuts. The nuts make it slightly sweet, the rendition here is very good. 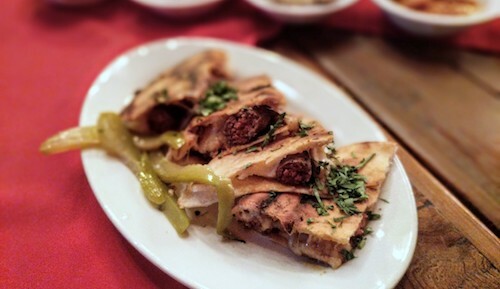 Popular in Syria, Lebanon, and surrounding areas, arayes are stuffed pita appetizers or snacks that are easy to eat with your hands. They have three options here, including the arayes sujok ($8) seen below. In this version, the pita is stuffed with spicy lamb sausage and cheese, and pairs very well with the yogurt-based lebneh. As this meal was only for two, the Mar Mar mixed grill ($22, below) offered the best chance to sample a few different kebabs. It comes standard with shish tawook (chicken) and kufta (ground beef), and then offers the choice between a filet mignon or lamb kebab. 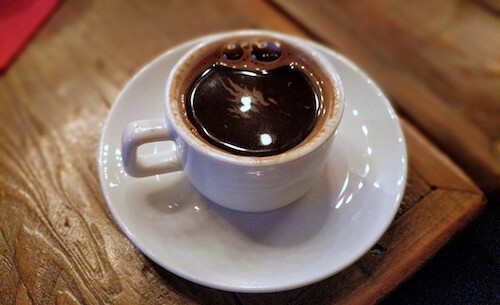 After your meal, a small Arabic coffee ($2, below) is a strong way to settle all those meats.